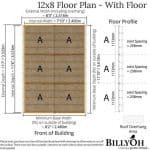 BillyOh 5000 is one of the best sellers on this site! This garden workshop gives a great first impression with its incredible 16 x 10ft interior and large windows that fill the space with light. A fantastic space in which to spend your time on your gardening and workshop projects, with plenty of practical room for storage also. BillyOh 5000, the ultimate garden workshop – by choosing the BillyOh 5000 Greenkeeper you are sure to be over the moon. 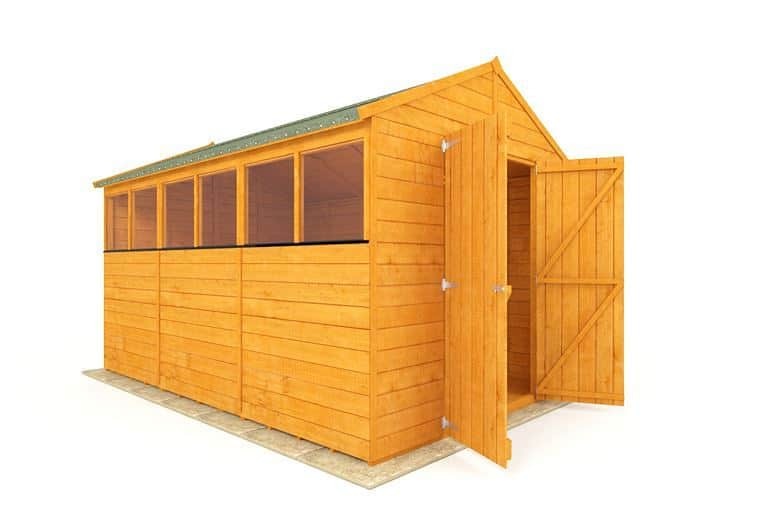 Giving you more than ample workspace with enough left over for excellent storage this is a top quality premium shed exceptionally well-priced. Complete with functional dual aspect windows to let light and air inside and large double doors to enable you to transport equipment to and from easily it’s one of our bestselling garden workshops. The tongue & groove cladding gives it extra strength and the hard wearing wood will make this shed last you for many years. Strong, sturdy and handsome it’s a real focal point for any garden space without being too imposing and the perfect place to escape from the hustle and bustle of modern life. 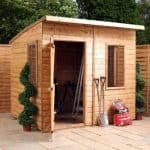 Great for keen gardeners or hobbyists to spend their time in comfortable, spacious surroundings, this garden workshop would also make a fantastic storage space for all of your outside and garden equipment. 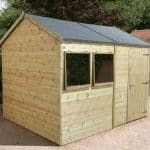 When searching for a garden workshop in which you may pursue all of your gardening projects and which will cater for your storage needs also, you may have many requirements on your wish list. With many models to choose from, below we take a more detailed look at features and aspects of the garden workshop that may help in your decision making process. Exterior: The Billyoh garden workshop is constructed using interlocking tongue and groove boards, which not only provide a strong and sturdy building but also present an attractive exterior within your garden. The wooden exterior is warm toned with unfinished wood allowing you to paint your garden workshop if you so wish. There is an apex roof that provides the building with a great 10ft height. Windows: With large, wide windows along one side of the building, light will flood inside. The height of the windows allows light in but restricts other’s view into the building from the outside which is great for security. Doors: The large double doors allow easy access to everything inside and are particularly useful for storing those large garden items such as trampolines or bikes. 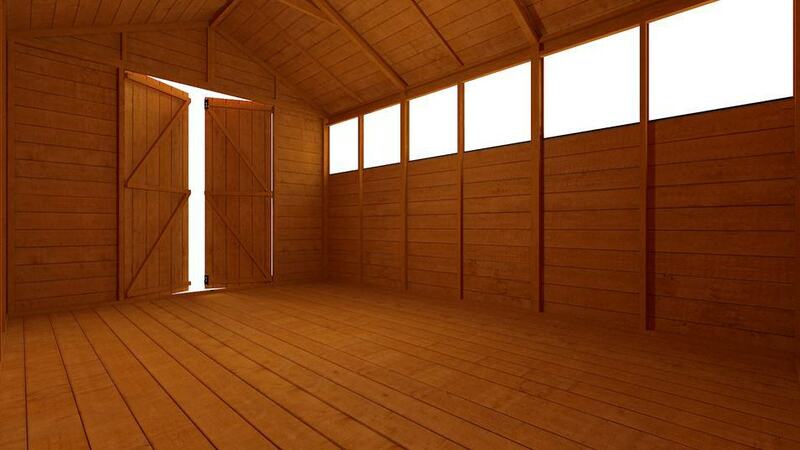 Interior space: The superb 16x10ft interior space offers many possibilities for the garden workshop’s usage. Interior shelving is an optional extra during the purchase process and would be particularly useful to keep smaller tools and other items neat and tidy. Alternatively, freestanding storage solutions could be utilised to create the ultimate storage facility for your garden and outdoor equipment. Security: No security fittings are included however a padlock or other security fittings could be easily added to the double doors to make them secure if need be. 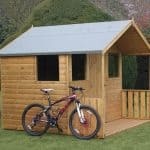 The Billyoh 5000 Greenkeeper Premium Tongue & Groove Double Door Garden Workshop: How easy to build? 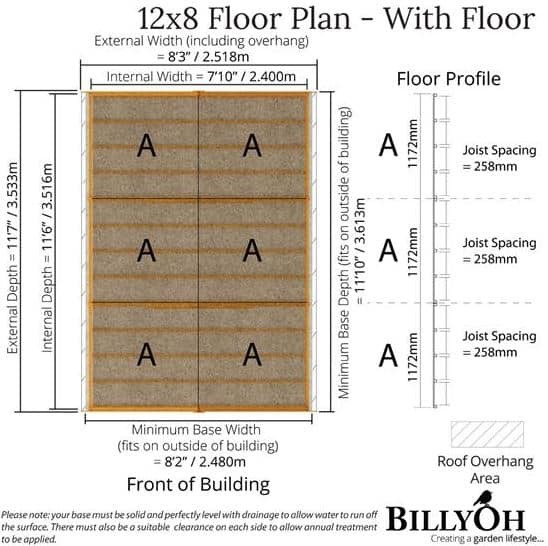 The Billyoh 5000 garden workshop will arrive flat-packed with all the parts, fixtures and fittings required for assembly. All that is needed is a basic tool kit for assembly and a clear instruction manual will be provided, including detailed instructions and easy-to-read diagrams. It is recommended that two people work together to assemble the garden workshop due to the sheer size and height of it. 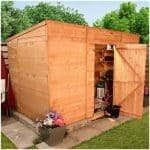 We expect that this shed could be put together within an afternoon if you have a good amount of DIY knowledge. The Billyoh 5000 Greenkeeper Premium Tongue & Groove Double Door Garden Workshop: What is the overall quality like? Billyoh is a British company that designs and manufactures its products all within the United Kingdom. As such you can be assured of the high quality and fantastic design features that make this the ultimate garden workshop for your gardening pursuits. 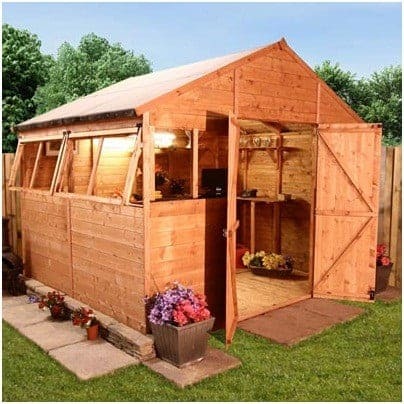 Constructed using strong interlocking tongue and groove boards, your garden workshop will endure even the toughest of wear and tear both inside and out. Great for peace of mind knowing that your equipment will be protected whatever the weather, all year round. Maintenance is minimal, with the garden workshop already having a water based treatment applied to ensure its longevity within your garden for many years to come. To clean simply hose down or sponge wipe with water and maybe a soapy solution to give your windows that extra sparkle. The unfinished wood surface offers the option of painting you garden workshop should you so desire, adding a touch of personalisation to your new work space. 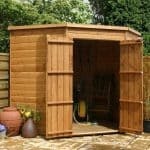 With an incredible 16x10ft interior, whether you use this garden workshop as a place to while away the hours on your projects or simply for storage space, the attractive tongue and groove wooden exterior will provide a nice addition to your garden. With multiple large windows and double doors, the interior is filled with light and air providing a comfortable environment in which to spend your time. 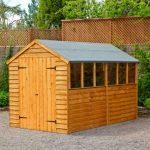 At a higher price than your average garden shed, we feel that this deserves its price point considering the amount of space and features this particular model has. I have only ever seen one of these one time and that was because my friend had one. He showed me the ins and outs about a growhouse. Ever since then I wanted one so bad. I came across this billyoh 5000 premium workshop and I couldn’t not buy it. I got it and I am like a pro at growing greens and other things now. I am glad I made the purchase. It is enough space for me. I am able to share greens with my family now, and I can tell people I grow my own veggie. The price wan’t that bad for something so beautiful. It is big enough for me and that is all that matters. The floors, the color of the wood, the space, the quality – just everything is absolutely amazing. It’s not painted and that is not an issue with me. I like all natural colors anyways, so I am going to keep mine as is. However, it is great wood for someone to paint over if they didn’t want a natural color. I recently purchased a billoh 16X10 workshop. The quality is absolutely shocking, I had it professionally built, it took 2 days to put up and there are gaps everywhere, window frames dont fit, panels are not straight and therefore leak, roof trusses were missing, felt for the roof was missing. Did they care ? No. Customer service is shocking and after weeks of fighting they offered me a 5% refund or i could return the shed which would have meant hundreds again in labour to take the bloody thing down of course they are not going to cover that. The service agent admitted after looking at the pictures that the quality was terrible. I am now faced with trying to patch it up the best I can. Pretty poor quality sheds. 2 separate gardeners we’ve had look at it have commented on how poor it is. Very fiddly to put together too with every part being separate. 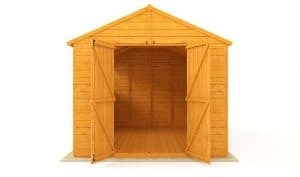 Whilst most sheds don’t seem great quality, would def avoid this one. Have you ever seen such poor quality. Our local supermarket sells better than this for much less. Customer service is a joke, delivery dates failed. Will now have to patch this together. Bought a corner summer house. The panels are so poorly constructed that a good fit is impossible. How are you supposed to make the roof fit if everything else is warped and poorly put together? And the instructions: why aren’t panels and everything else numbered. It would certainly help to make sense of this rubbish. Please, please stay away from this cowboy outfit, please. Very very cheap nasty poor quality roof felt. As thin as Rizla paper and last 12 months before the ceiling my of both my summerhouse and sheds became soaking wet chip board that started to swell. So on hot days there would be a condensation build up inside, with nowhere to escape. So, evidently we had a build up of mildrew and dampness on the walls, ceilings and contents. Had to really re-enforce the ceiling of the summerhouse too. So flimsy in design and construction.